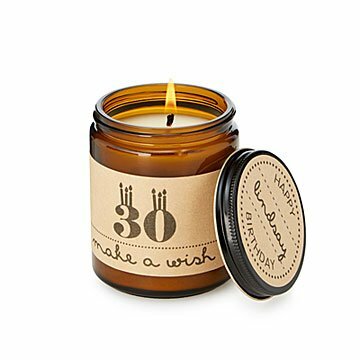 This cake-scented soy candle comes custom labeled with the name and age of grown-up birthday boy or girl. Bring back the childhood magic of birthday candles, but with a twist: no one will wish to blow this one out. Sandrine Froehle's version comes with charming, illustrated labels that are custom printed with the name and age of the lucky, grown-up birthday boy or girl. The cake-scented candle is hand-poured, using a soy-based wax that is petroleum-free and burns 30-50% longer than paraffin, so the happy glow of their special day can go on and on. Handmade in Astoria, Oregon. "It gives me such pleasure to know that my designs bring happiness to the homes they make their way to," says Portland, Oregon artist Sandrine Froehle. Sandrine captures the love shared between individuals in her work. From her first piece—portraying a newly engaged couple that split the distance between California and Scotland—she has had the opportunity to represent long-distance relationships the world over. "My favorite part in this process is being able to travel the globe from the comfort of my own home. It's amazing how we all find the one we are meant to be with." 3.5" H x 2.5" dia. ; 9oz. Never leave a burning candle unattended. Keep away from drafts, pets and children. Only burn the candle on a level, fire resistant surface. Candle burns approximately 50 hours. This is a made-to-order item. If you order today your item will ship no later than 4/26/2019. I would most definitely purchase this product again. Bought this for my daughter who is away at college - although she won't burn it - the smell will brighten her room and the personalizarion will make her very happy! Awesome Gift Idea! The candle smells just like cake! Awesome Gift. Looks and smells good. It was the perfect gift for a birthday celebration! Perfect size. Simple and elegant. Not so much at first/when unlit, but when the candle was blown out, everyone commented on how much it smelled like a cake. I def will be buying this gift again!